How much is a smidgen? A dash? Okay, Grandma, could you have been a little more specific in your Snickerdoodle recipe? With our cute and witty measuring spoons, you'll never have to guess about tiny measurements again. The perfect gift for anyone, from a beginner cook to a picky perfectionist. By Mrs. Anderson's Baking. 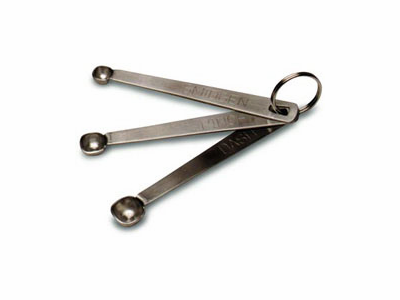 Three thick, stainless steel measuring spoons on a ring: Smidgen, Pinch, and Dash.